Wow! We were busy last year, continuing to build a purposeful, joyful, and collaborative impact investing ecosystem. As we roll into 2018, we’re keeping some wheels moving and starting to turn some new ones. Thank you to all of you for supporting us along the way and continuing to put impact first. We are happy to have you with us on this journey. Read on to see where we’re headed in 2018. These numbers amaze us! We are blown away by how many of you engage with our content. We hope your interest continues to grow, and we can continue to provide valuable information for you throughout your journey in impact investing and social entrepreneurship. Is there something you want us to talk about more often or share with our wider network? Just let us know. One of our goals for 2018 is to create more robust connections between actors in the social entrepreneurship and impact investing space. We believe these connections are key to sparking greater change and providing more opportunities for collaboration in the field. In order to learn about connections that are relevant to you, be sure to follow us on Facebook and Twitter, and don’t forget to sign up for our monthly newsletters: PeakInterest helps keep you in touch with what’s going on in the space, and PeakOpportunities showcases ways anyone, accredited or not, can invest for impact. When we’re not busy with our own work, we make it a priority to support others in the impact investing and social entrepreneurship community. Some of the standout moments last year were our conference season sprint, ringing the NYSE opening bell with Change Finance, and presenting keynotes at Rockies Venture Club and the CO Universal Healthcare Conference and a lightning talk at International Women’s Day. These were only a few of the hundreds of community events in which we participated. We look forward to the conversations we will get to have and events we plan to attend in 2018. Join us in the front row at an event - the more the merrier! Check out our events calendar to see the upcoming happenings in the impact community. We refined processes, built out new tools for our services, and created a library of resources in 2017 - plus, we had a few portfolio exits. Our portfolio had four exits; and thankfully most of them were successful! Be on the lookout for a blog on these exits. We want to share our experiences and exit-related learnings in an effort to support other impact investors as they navigate similar processes. We were also lucky to build out the PeakChange team as we continued to grow our efforts this past year. We launched our Graduate Fellows program in January 2017. Four graduate students from the University of Denver participated by supporting various research, development, and communication needs of the organization. What’s more, we added two team members to the PeakChange team at the end of 2017. The Denver Business Journal, in conjunction with the Impact Finance Center, launched its “Who’s Who in Impact Investing” campaign this past fall. After a call for nominations, we were thrilled to find out Jim Davidson and PeakChange received the award in the family office category. We’re looking for a repeat recognition in 2018! A few years ago, Jim pledged to move 100% of his portfolio assets towards impact as part of Toniic’s T100 initiative. This pledge encourages investors to move toward impact investments across all asset classes. 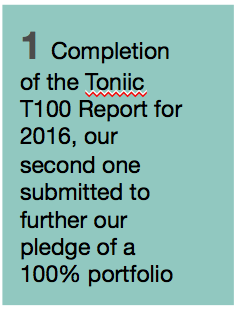 This year we completed our second T100 report using Toniic’s new SDG framework. We hope to present our experience with the T100 reporting tool, report our progress, and encourage others to participate and make the pledge in 2018. As a prominent Colorado gender lens, angel investor, Melanie was asked to contribute to Cornerstone Capital’s first Impact Report. The report features many Colorado thought leaders entrenched in the impact investing space. Her piece, “Welcome to the Impact Frontier,” highlights the ways Colorado leads on impact. There’s no need for the Denver-Boulder region to try to replicate other entrepreneurial communities, such as silicon valley. Rather, the action, innovation, and thought leadership coming out of this region contributes our unique perspective to the social entrepreneurship industry. In order to better serve the impact community, we are launching a consulting arm that offers supporting services to individuals, groups of investors, and entrepreneurs. The services include portfolio management, due diligence, co-investment and syndication management, and entrepreneurial company audits. We’re excited to see how we can serve the Colorado ecosystem in 2018 with these offerings. If you’d like to learn more about our consulting services or know someone that would, we’d love to hear from you! Email us at info@peakchange.co.